Apport has optimized warehouse logistics for companies all over Scandinavia since its start in 2000. The foundation is a strong WMS, but it is our focus on people and change processes that makes all the difference. Forget about the technicalities for a moment. For us, efficient warehouse management is about putting people over systems and think process over technology. Technology is an indispensable tool, but it is people who makes the change. This is why our mantra is: People over systems. Process over technology. Results above all. We want to create results, that can be felt – in the warehouse and on the bottom line. This is why we invest time in understanding your warehouse and needs, the same way that we focus on the change, a WMS needs to result in, and that it is rooted well with the employees. We do this to make sure that a new WMS does not just become an IT project, but a real improvement af your warehouse management. In the end, knowledge and dedication is what seperates the sparring partner from the supplier.We always strive to become a trusted advisor, which is why we have the pleasure of cooperating with our clients through many years. At Apport, we are strong believers in keeping things simple. Our WMS is built with a focus on usability – we work from a project model that’s been proven to be successful and we always promise a fixed price – and keep this promise. Simple does not always equal easy, which is why you will find that we have a few demands to our cooperation. First and foremost to ourselves, but also to our customers. This is why after years of experience, we know what a WMS project requires to stay on track and end out as a success. The results speak for themselves. 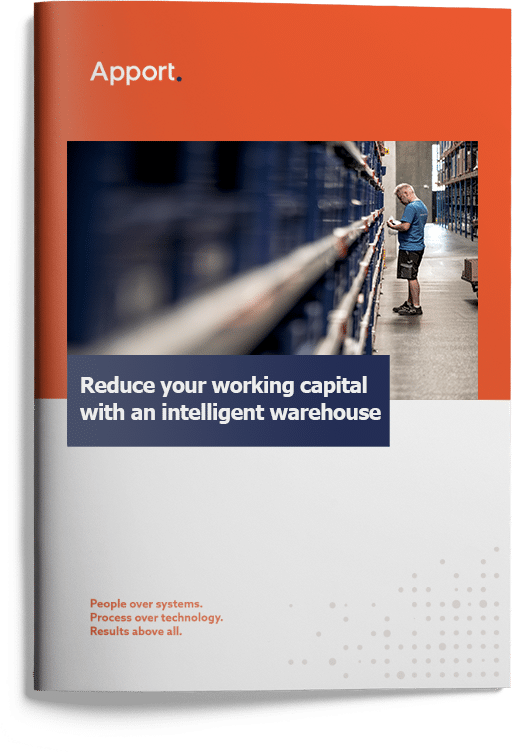 Out customers generally experience an efficiency increase in their warehouse with 25-40 percent – a significant drop in picking errors and an improved work environment. What are we supposed to live on in the future? Production has for a lot of companies moved to the east and our head start in the knowledge of it diminishes day by day. The last bastion is logistics. The winners of tomorrow are those companies, that are best at moving wares. But consumers no longer put up with mediocre service and slow delivery and it takes a strong logistics chain to live up to their demands. At Apport we strive everyday to optimize our customers’ warehouse logistics, so that the warehouse no longer is a necessary evil, but a strong competitive advantage. Why are we called Apport? Apport comes from the french word, meaning "to bring" (apporter) and is primarily used as the command a hunter gives his hunting dog, when he needs it to return its prey. Apport WMS ensures that your products are optimally brought through the logistics chain. From receptions of goods through picking to shipping - the right product, the right way at the right time.